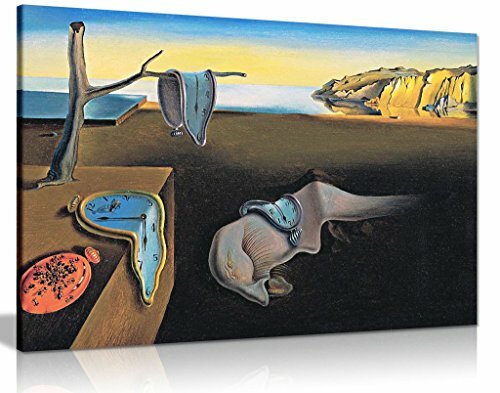 Salvador Dali Persistance Of Time Canvas Wall Art Picture Print decor ready to hang in your home, office or even bedroom. Panther Print Canvas prints are of high quality and come framed on a 18MM Pine wood lightweight frame with the canvas stretched over and around the frame, this is then stapled to the rear out of view. The Canvas is professionally hand made just for your order by Panther Print. Your canvas art arrives ready to hang, and no additional framing required. Every canvas print is hand-crafted, made on-demand at Panther Print� and expertly stretched around 100% European Pine wood stretcher bars. We only use industry leading genuine archival HP VIVERA inks to achieve the most vivid and high-definition canvas prints possible. Whether kitchen, living room, bedroom, hallway or nursery - a canvas picture beautifies any room and is the perfect way to fill empty walls and bring a touch of colour in your living spaces. Also in the office or in the hotel room provides a canvas picture a friendly atmosphere, and impresses your customers and guests. Convince yourself of our huge selection of licensed images from various categories such as Food & beverage, beaches, landscapes, nature, animals, plants, spa, Comics & Abstract, Adult and more. Easily find your desired artwork by typing in the search bar �Panther Print canvas picture & your search term". With us you will not only get affordable and cheap artwork, but also premium archival grade quality canvas print art hand-made to order. The designs are printed with genuine HP VIVERA pigment inks on high quality canvas and stretched on a 18mm thick solid pine wood frame. This ensures that contrast-rich and radiant colour results are produced. Salvador Dali Persistance Of Time Canvas Wall Art Picture Print. Quality You'll Love With Archival Grade Materials & Vivid Colours . This Beautiful Canvas Wall Art Will Brighten Up the decor in your Home, Office, Living Room, Bedroom, Nursery & even Bathrooms! AMAZING QUALITY CANVAS ART - Genuine HP Vivera UV Resistant Pigment Inks Ensuring You Get The Highest Quality, Vibrant, Accurate Colours! GUARANTEED to brighten up your home and walls, don't settle for dull or inferior/poor print quality! If you have any questions about this product by Panther Print, contact us by completing and submitting the form below. If you are looking for a specif part number, please include it with your message.